The end of the year is always chock-full of celebrations, gift-giving and merriment, but it’s incredibly important to remember to dedicate time to think back on your year and look forward to what you want to accomplish in the coming new year. Setting resolutions is about more than making a wish as the clock strikes midnight on New Years Eve. Resolutions are a beautiful reminder that January 1st is a clean slate and you can accomplish anything you set your mind to. There is no better way to keep track of your life and stay organized (which is crucial when looking to achieve goals) than with a planner. We recommend our bestselling LifePlanner™, available as both a 12-month Hardbound or a 12-month Coiled option. Your LifePlanner™ is a space you can jot daily intentions, celebrate monthly milestones & get inspired to stay on track! Whether you’re setting financial, professional or personal goals, keep everything in one colorful & wonderful space. Monthly overview pages let you make a game plan for the month ahead, while our weekly layouts help you tackle each week. 12 “mini months” at the front of the book are the perfect space to set a goal for each month of the year, so it’s easier than ever to plan out your dreams. 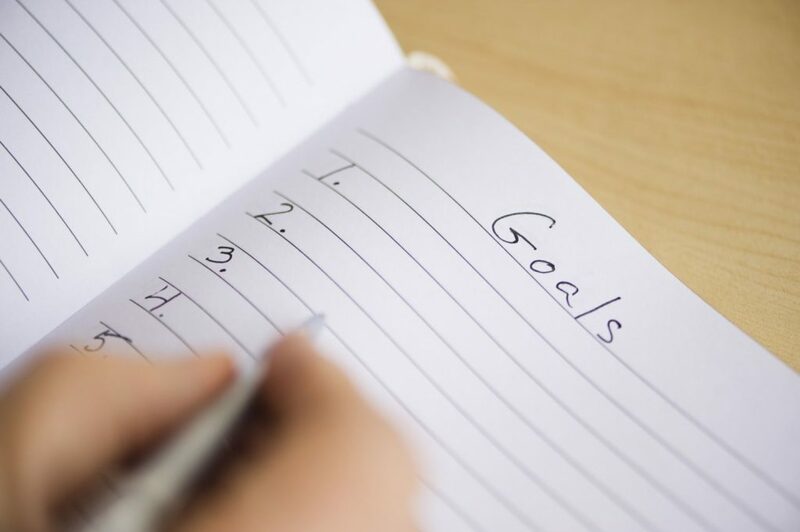 You’re 42% more likely to achieve your goals just by writing them down, so give it a chance! Don’t overwhelm yourself by setting an unattainable list of items you’d love to see happen. Prioritize 1-2 main goals and then develop action items to accompany them. While it may seem difficult to do when you have a list of resolutions, it’s important to understand and rank which you need to emphasize. If you’re focusing on wellness, make your goal about improving overall wellness and then set achievable and measurable benchmarks to accompany that goal, like “drink 8 glasses of water per day” or “go to the gym twice per week.” By defining specific ways you can reach your goal, it will be easier to track your progress! Make sure you aren’t setting yourself up to fail by setting benchmarks that are unattainable! You can always readjust your goals to fit once you see how well it all balances. It’s easy to feel discouraged or beaten down, so prepare for and anticipate hurdles. Plan ahead and schedule a meditation session or book tickets to a conference to see a motivational speaker! If you can properly prepare for moments of discouragement, you can easily get yourself back on track! 5) Add color and inspiration! Setting goals is one thing- but sticking to them is another! Add festive pops of color, inspirational quotes, festive stickers and pictures to your planning so you can stay positive and focus on the fun!